Water Street Bindery is located in the heart of historic downtown Lancaster, Pennsylvania. The 19th century bookbinder's house in which proprietor Tony Haverstick serves his clientele has been designated an historical landmark, and rekindles the spirit of yesteryear. Bookbinder Tony Haverstick has been in the business of antiquarian bookbinding and repair since 1970. During this time Tony has had the opportunity to work with renowned bookbinders including Dr. Frank Kafka and Fritz Eberhardt (who has bound books for Queen Elizabeth II and Pope John Paul II). 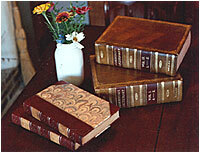 Tony has published three articles on the repair and restoration of antiquarian books. The services of Water Street Bindery consist of 75% restoration and 25% fine leather binding for 17th, 18th and 19th century books to archival standards. Tony's tremendous craftsmanship and experience with the construction of books and materials they are made from is exemplified in each restoration he undertakes. For additional information about the services of Water Street Bindery contact Tony Haverstick HERE.